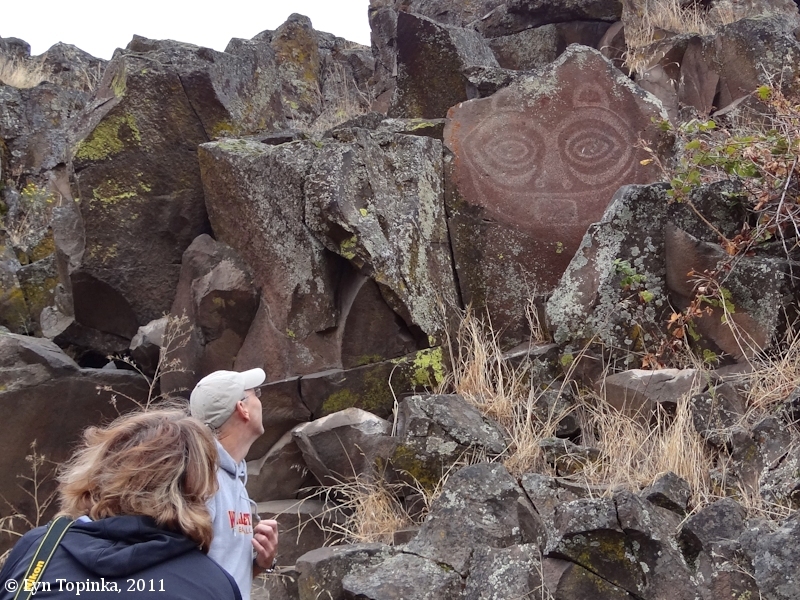 Click image to enlarge "She Who Watches", Petroglyph, Horsethief Lake Park (Columbia Hills State Park), Washington. Image taken October 15, 2011. 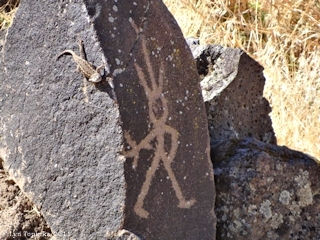 Native American rock art is of two types, "petroglyphs" and "pictographs". 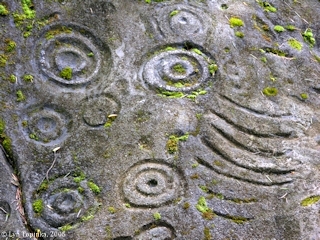 Petroglyphs are images carved into the rock surface. Pictographs are images painted on the rock. There are a few examples of a combination of the two. It has also been shown that rock art objects can be divided into two broad categories -- private and public. Those considered private were clearly intended for only the individual that created them. They tend to be small images located in protected settings out of the view of most passersby. Public images are large, located in prominent places, and often very colorful. Archaeological studies show the area from The Dalles, Oregon to Pasco, Washington, attracted vast numbers of tribal people from around the West who came to fish, socialize, and trade. During salmon migrations this area attracted thousands. 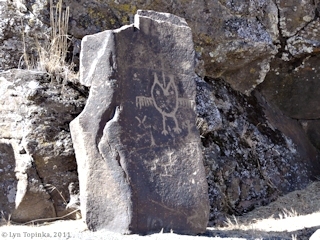 These tribal groups believed in a connection with their environment and the spirit world existed within the basalt rock features. 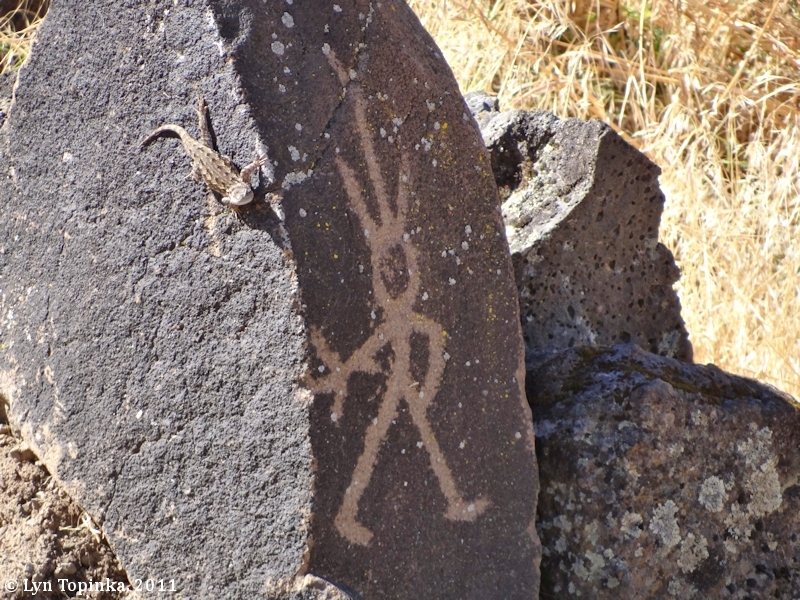 Petroglyphs and pictographs were created along the massive basalt walls of the rivers and canyons. 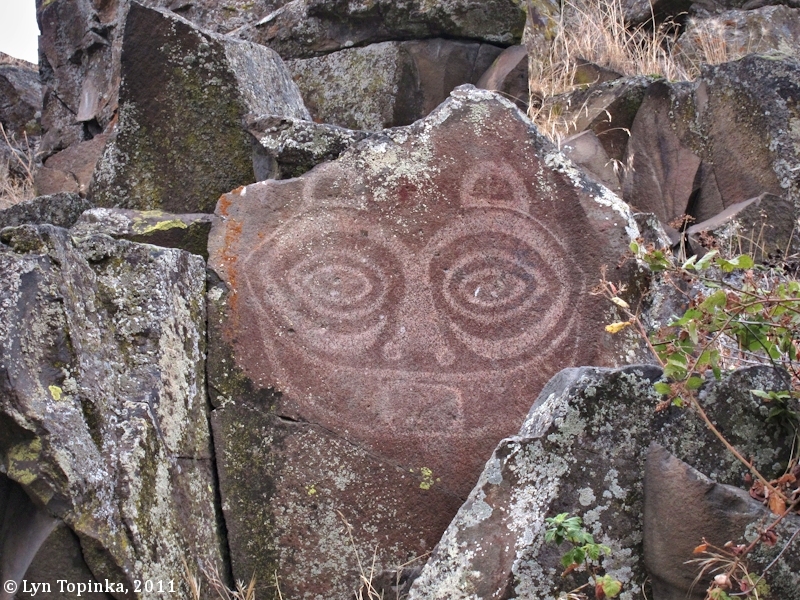 More than 160 rock art sites have been found in this lower Columbia area, with nearly 90 of them being along the Columbia River between The Dalles and Pasco, with other large concentrations along the middle and lower Deschutes River, and scattered sites in the Yakima and John Day river drainages. Click image to enlarge Petroglyphs, Horsethief Lake Park (Columbia Hills State Park), Washington. Image taken September 28, 2011. 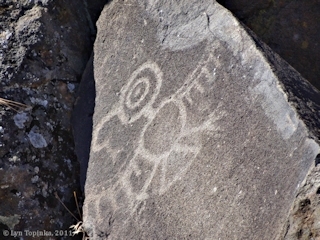 Petroglyphs are images carved into the rock surface, and were formed through pecking, or scratching, a rock face. By scratching a rock in this manner the weathered surface, or patina, of a rock face is removed to show a lighter layer below. This action would cause the image to stand out from the rest of the rock's surface. Pictographs are images painted on the rock involving the use of colored pigments. 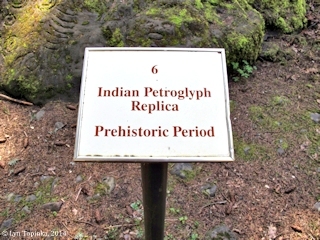 According to "American Indian Rock Art in Oregon and the Pacific Northwest" (2008), the pigments used in Oregon and Washington were primarily red, black, and white. To a lesser extent yellow and green pigments were also used. The reds, oranges and yellows came from local deposits of iron oxides (hematite and limonite). Black came from mostly coal, while white came from certain clay deposits. Green and blue-green pigments originated from copper oxide. Pigments were first ground into powder and then mixed with various "binding" agents (water, urine, saliva, blood, eggs, fats, plant juices, etc.). They were then painted upon the rock face with fingers, or tools such as improvised animal hair brushes, sticks or twigs. Research indicates that red and white pigments were used for their spiritual significance. Red pigment represented blood, or life giving forces. Whereas white, associated with the whiteness of bones, was considered to represent death or, possibly, the spirit realm. 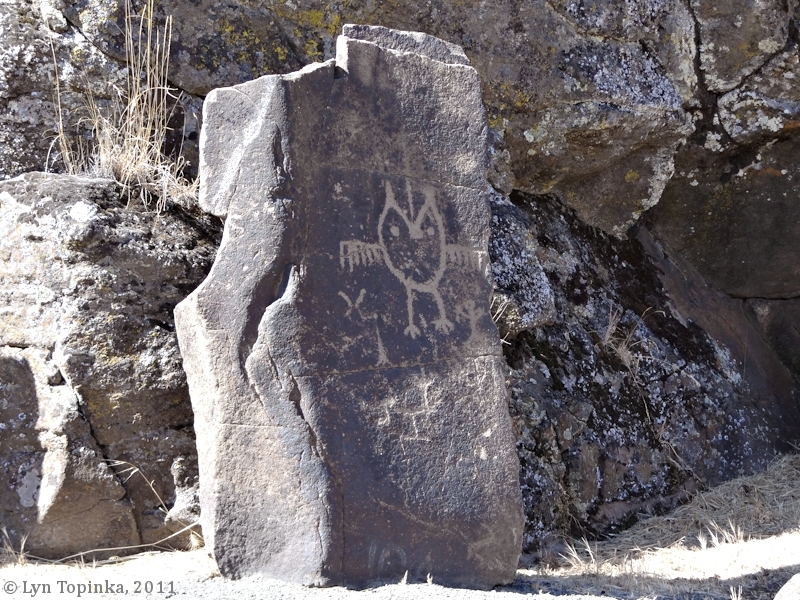 Today many spectacular petroglyphs and pictographs can be seen at the Columbia Hills State Park (formerly Horsethief Lake State Park), including nearly 40 petroglyphs taken from the now submerged "Petroglyph Canyon". Klickitat County, 45KL87: In 1977-1978, Richard H. McClure, Jr. compiled a database of 235 rock art sites thoughout the State of Washington. "The Petroglyph Canyon Site (includes what has been refered to as "Petroglyph Island"). The area is located in the SE 1/4 of the NE 1/4 of Section 19, T2N, R14E. 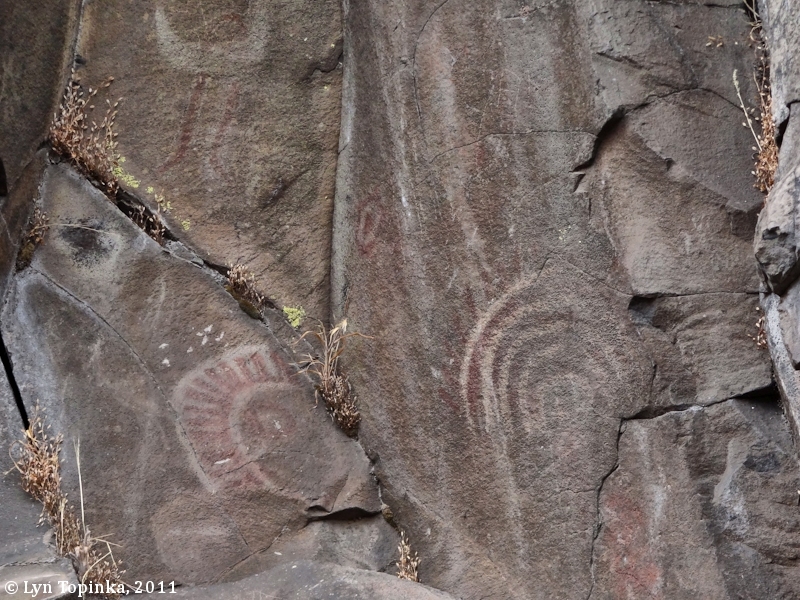 Petroglyphs occur on the walls of a small canyon which served as a high water channel for the Columbia River. Glyphs continued on around the outside of a butte facing the river channel. The site was near the present northeast end of Horsethief Lake State Park. No less than 450 individual petroglyph figures were noted by previous investigators of this site. The most common single motif was the mountain sheep. Also present in significant numbers were other quadrupeds and a wide variety of anthropomorphic figures, some engaged in hunting scenes. Well known in a wide variety of publications are the bird figures known as "Spedis Owls" that occur in a number of panels here. Besides the owls, a few other bird figures occur. Several large faces, either anthropomorphic, zoomorphic, or mythological are found along with a wide variety of unidentifiable zoomorphic forms. In February of 1957 salvaging of some of the best of the petroglyphs was carried out under the supervision of the U.S. Army Corps of Engineers and the National Park Service. ... The original site was inundated in April of 1957." Source: Richard H. McClure, Jr., 1978, "An Archaeological Survey of Petroglyph and Pictograph Sites in the State of Washington": The Evergreen State College, Archaeological Reports of Investigation, No.1. 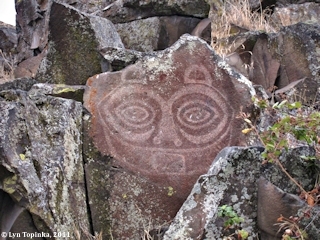 Click image to enlarge Petroglyph, Horsethief Lake Park (Columbia Hills State Park), Washington. Image taken September 28, 2011. 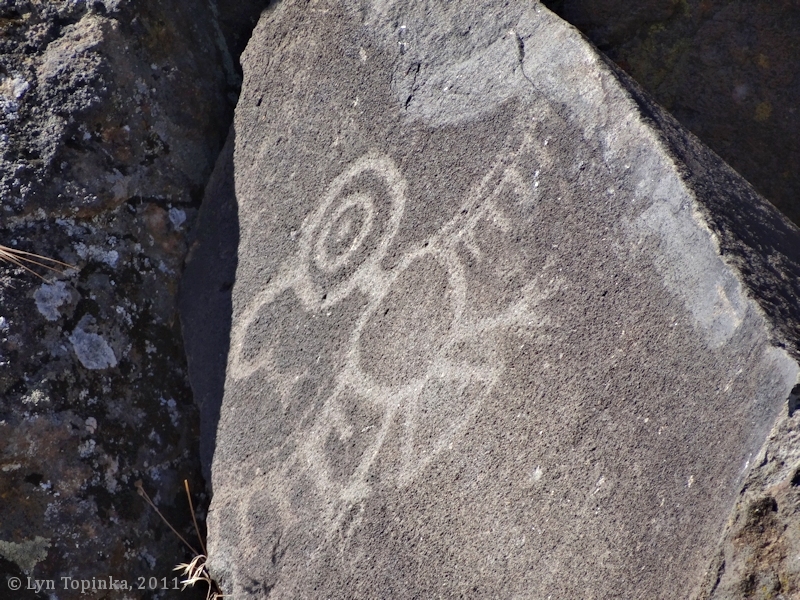 Click image to enlarge "Spedis Owl" Petroglyph, Horsethief Lake Park (Columbia Hills State Park), Washington. Image taken September 28, 2011. According to "American Indian Rock Art in Oregon and the Pacific Northwest" (Oregon Archaeological Society, Winter 2008), pigments used in pictographs along the Columbia River were mostly red, white, and black. The reds came from local deposits of iron oxides (hematite and limonite), white from certain clay deposits, and black mostly from coal. The pigments were ground into powder and mixed with a binding agent (such as water, urine, saliva, blood, eggs, fats, and plant juices) and painted upon the rock face using ones fingers or fashioned tools. Research indicates that red and white pigments were used for their spiritual significance with red pigments representing blood or life giving forces and white, being associated with the whiteness of bones, was considered to represent death or, possibly, the spirit realm. Click image to enlarge Pictographs, Red, White, Black, Horsethief Lake Park (Columbia Hills State Park), Washington. Image taken October 15, 2011. 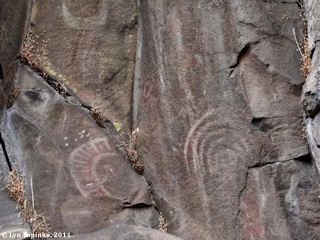 Click image to enlarge Pictographs, Red, White, Horsethief Lake Park (Columbia Hills State Park), Washington. Image taken October 15, 2011. 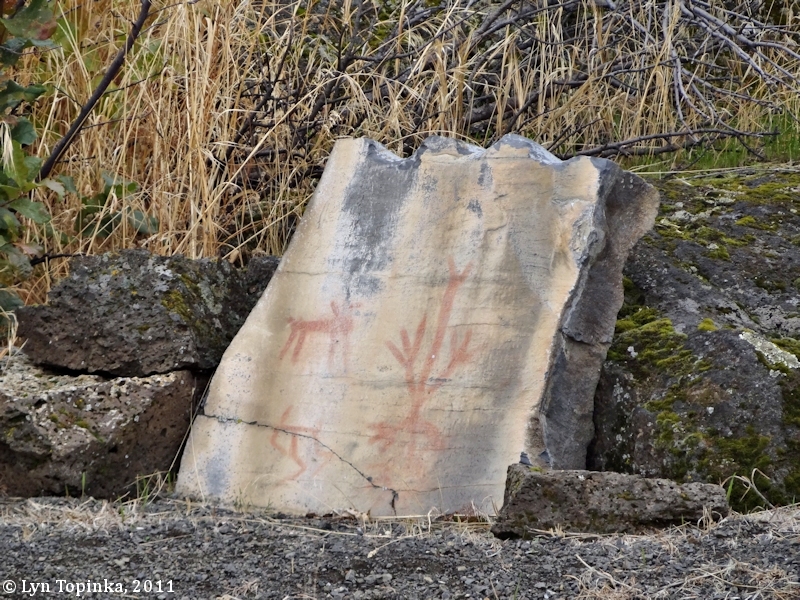 Klickitat County, 45KL62: In 1977-1978, Richard H. McClure, Jr. compiled a database of 235 rock art sites thoughout the State of Washington. "The Steward Site. Located in the SE 1/4 of the SE 1/4 of Section 14, and the NW 1/4 of the SW 1/4 of Section 13, T2N, R15E, this site is on the south central shore of Miller's Island. 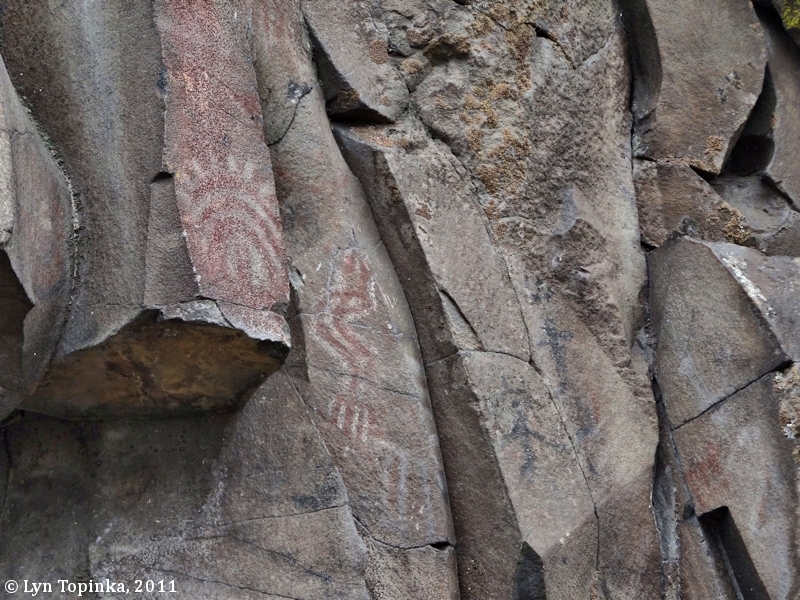 Pictographs in association with seven burials are reported at the base of basalt cliffs. The red and white pictographs were partially destroyed by removal of a portion of cliff for road fill for Interstate 80 [now Interstate 84]. It is uncertain what types of figures were destroyed. Of the remaining figures is a large and bizarre stylized anthropomorph. Other pictographs have reportedly been buried by drifting sand. 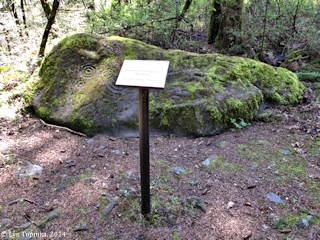 A large rock fragment currently displayed with petroglyphs from site 45 KL 87 at The Dalles Dam [now on display at Columbia Hills State Park, formerly Horsethief Butte State Park] is from this site. On the rock are red pictographs representing an anthropomorph with rayed head and a quadruped. ..."
Click image to enlarge Pictograph block which was removed from Miller Island and now on display at Horsethief Lake Park (Columbia Hills State Park), Washington. Image taken October 15, 2011. One of the finest examples of Native American public rock art is "Tsagaglalal", also known as "She Who Watches". 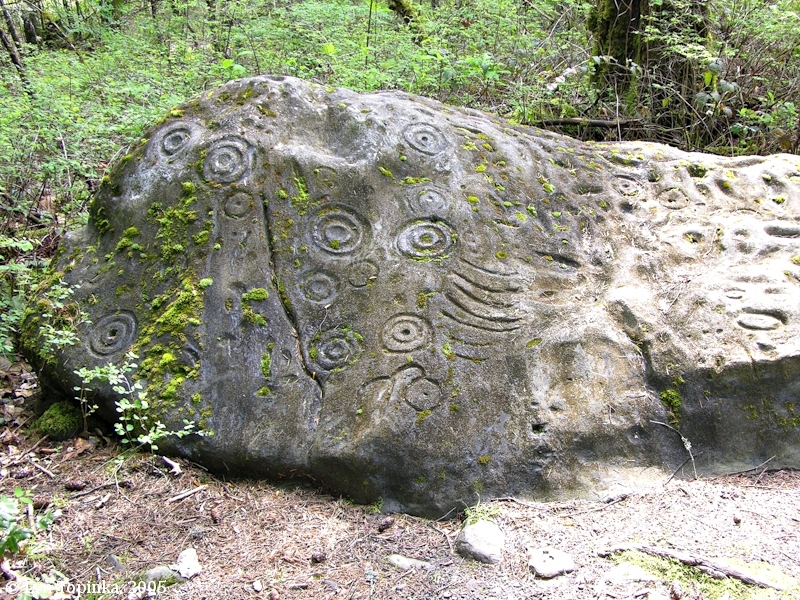 This spectacular petroglyph is at the end of the Columbia Hills State Park guided trail walk. 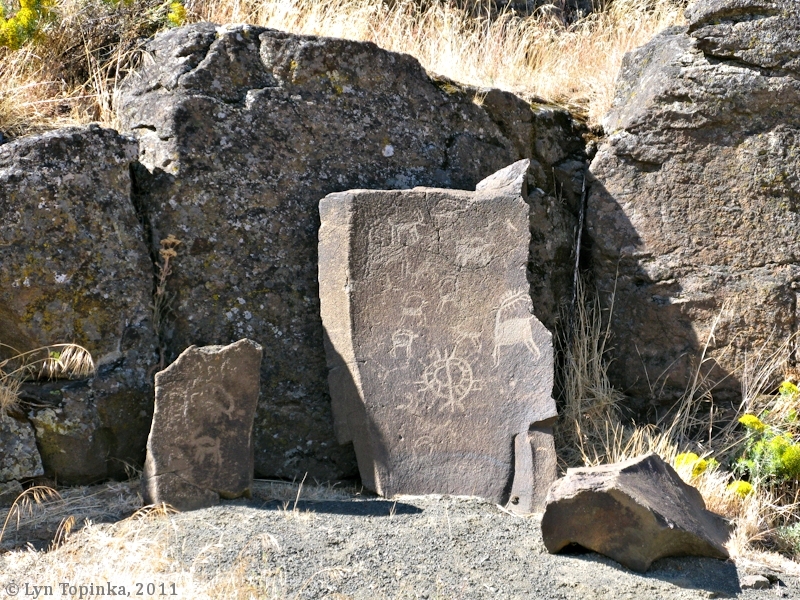 Klickitat County, 45KL58: In 1977-1978, Richard H. McClure, Jr. compiled a database of 235 rock art sites thoughout the State of Washington. "The Tsagiglalal Petroglyph/Pictograph Site. This site is found in the S 1/2 of the SW 1/4 of Section 19, T2N, R14E, in the southwest corner of Horsethief Lake State Park. 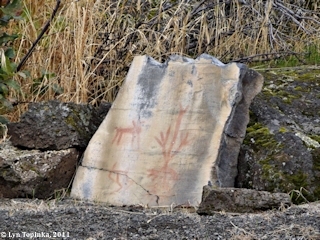 Rock art occurs on basalt cliffs facing the Columbia River for a considerable distance. 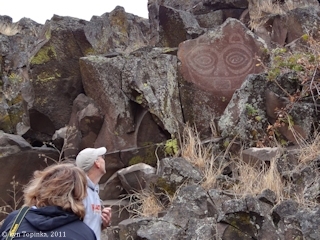 Perhaps the most well-known of all Washington petroglyphs is the large face known as Tsagiglalal, the Wishram word translated as "She who watches all who are coming and going". 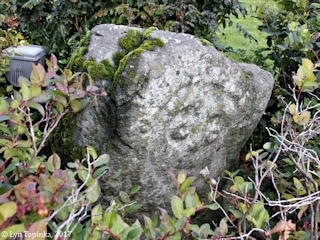 This anthropomorphic face is lightly pecked through the oxidized surface of the rock. Two other petroglyphs are noted here. One is an owl figure, shallowly pecked, and the other, possibly non-aboriginal, is an anthropomorphic face. Red and white pictographs are also present with both pigments sometimes present in a single figure. About 75 individual pictographs were found. A number of arcs and concentric circles with rays are present. Other figures include a "rabbit-eared" anthropomorph with detailed face and holding bow and arrow, two owl-like faces, four point stars, a large anthropomorphic face in red and white with alternating red and white zig-zag lines extending from top of head, and a few simple anthropomorphs. At the extreme north end of the site is a lizard figure. Other zoomorphic figures, including one or two quadrupeds exist. ..."
Click image to enlarge Exhibit, petroglyphs. Columbia Gorge Interpretive Center, Stevenson, Washington. Donors: Richard and Marilynn Weaver, Stevenson, Washington. Image taken July 15, 2011. "Near Fisher's Landing, Washington (milepost 19), occur boulders showing series of pits sometimes with connecting channels, and one grou, 2.5 to 3 m. long, of deep notches each several centimeters long along the top of a sharp-edged boulder. (A similar group of notches was seen on Miller's island.) At Fisher's Landing are also deeply pecked faces and a bedrock mortar decorated in anthropomorphic form with ribs indicated. Some of the pits may be due to natural action since many of the boulders are frequently under water." Source: Strong, W.D., Schenck, W.E., and Steward, J.H., 1930, "Archaeology of The Dalles-Deschutes Region: University of California Press, Berkeley, California. Clark County, 45CL6: In 1977-1978, Richard H. McClure, Jr. compiled a database of 235 rock art sites thoughout the State of Washington. "The Fisher's Landing Site. Found in the NE 1/4 of Section 12, T1N, R2E, is this habitation site with associated petroglyphs. On the beach at the landing are two large boulders bearing "cupule" or pit petroglyphs. One boulder has over 400 such pits on its west side. 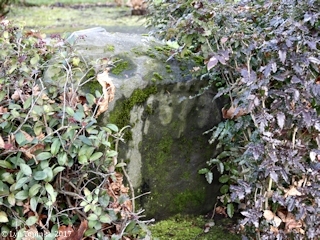 The second boulder has fewer pits on its flat upper surface. 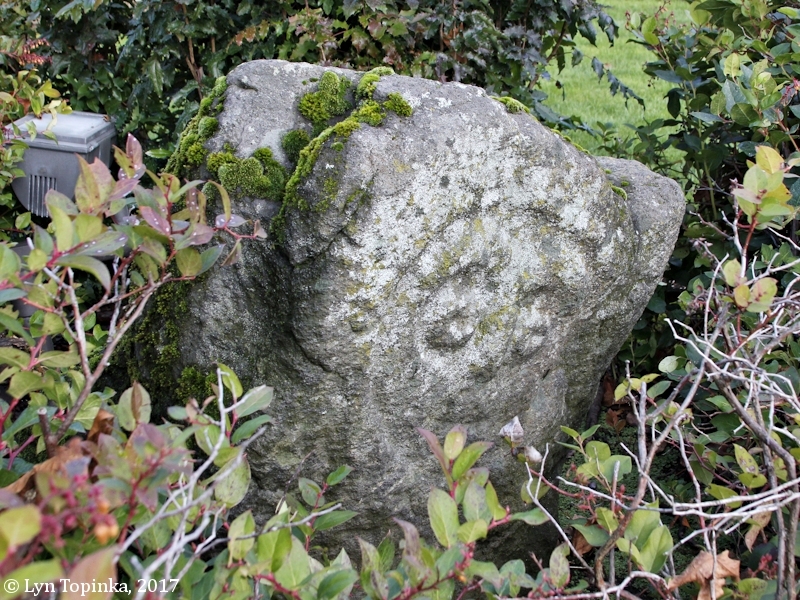 A short distance to the north of the beach and on a low boulder in a private garden is found a large zoomorphic petroglyph incorporating a mortar into the body of the figure. The site was visited in 1977 and 1978 but searches failed to locate the zoomorphic bowl noted in several bibliographic sources." 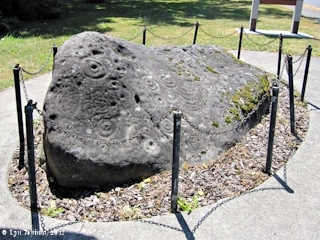 A replica of a prehistoric Indian Petroglyph sits within the Fort Cascades National Historic Site and the original petroglyph boulder sits in front of the Skamania County Courthouse in Stevenson, Washington. Skamania County, 45SA23: In 1977-1978, Richard H. McClure, Jr. compiled a database of 235 rock art sites thoughout the State of Washington. Click image to enlarge Prehistoric Indian Petroglyph, Fort Cascades National Historic Site. Image taken April 7, 2014. 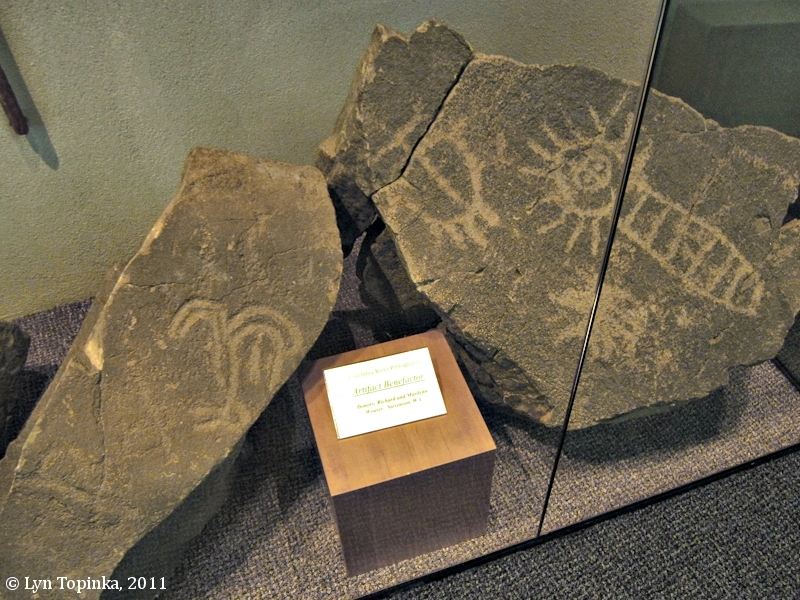 Click image to enlarge Prehistoric Indian Petroglyph, Fort Cascades National Historic Site. Image taken April 2, 2005. 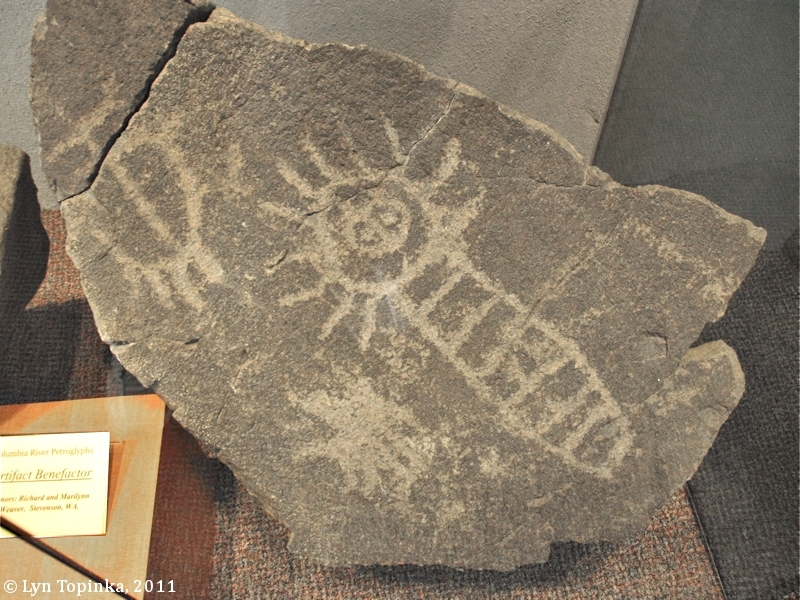 Click image to enlarge Prehistoric Indian Petroglyph, Fort Cascades National Historic Site, North Bonneville, Washington. Image taken April 2, 2005. Click image to enlarge Petroglyph rock, Stevenson County Courthouse, Stevenson, Washington. Image taken July 15, 2011. 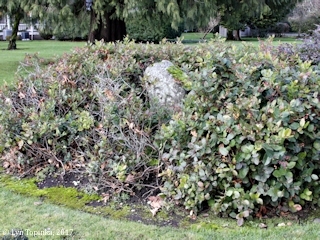 Two large boulders, each with a single face petroglyph, are in front of the Grant House, Officer's Row, Vancouver Barracks, Vancouver, Washington. On a visit in December 2017, the westernmost boulder had been cleaned while the easternmost petroglyph was covered in lichen. Klickitat County, 45KL26: In 1977-1978, Richard H. McClure, Jr. compiled a database of 235 rock art sites thoughout the State of Washington. "Wakemap Mound. This well publicized occupation site was found in the SW 1/4 of the SE 1/4 of Section 19, T2N, R14E. Two large boulders with petroglyphs were formerly located within about 15 meters of the northwest edge of the mound. This is the general area of the present Horsethief Lake State Park [now Columbia Hills State Park]. Each boulder contains one large, simple figure of a human face. 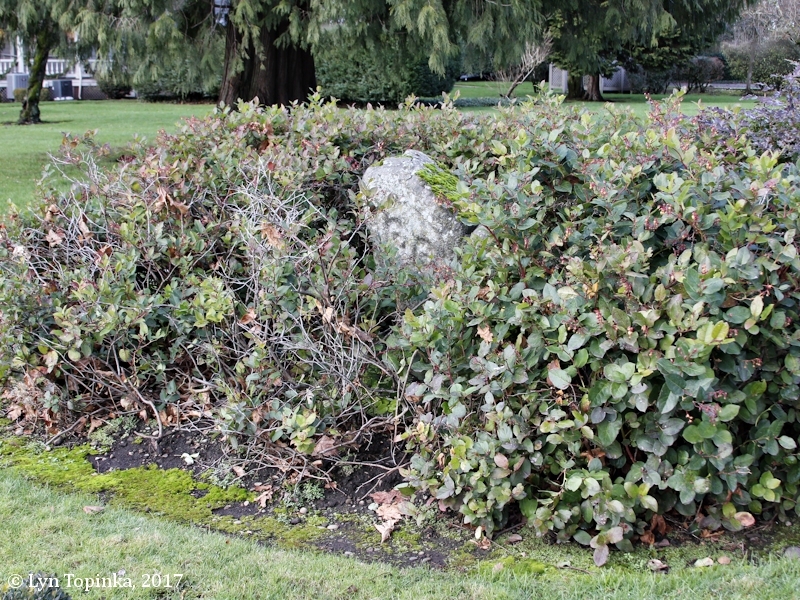 Prior to the inundation of this site in 1957, these two boulders were removed to Vancouver, Washington, where they are now displayed in front of the U.S. Grant House Museum. Both figures are well covered by lichens." 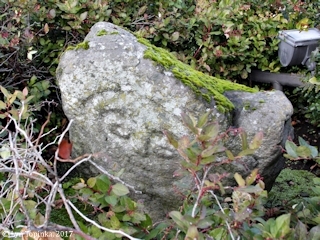 Click image to enlarge Western Petroglyph outside the Grant House, Officer's Row, Vancouver, Washington. Image taken December 23, 2017. 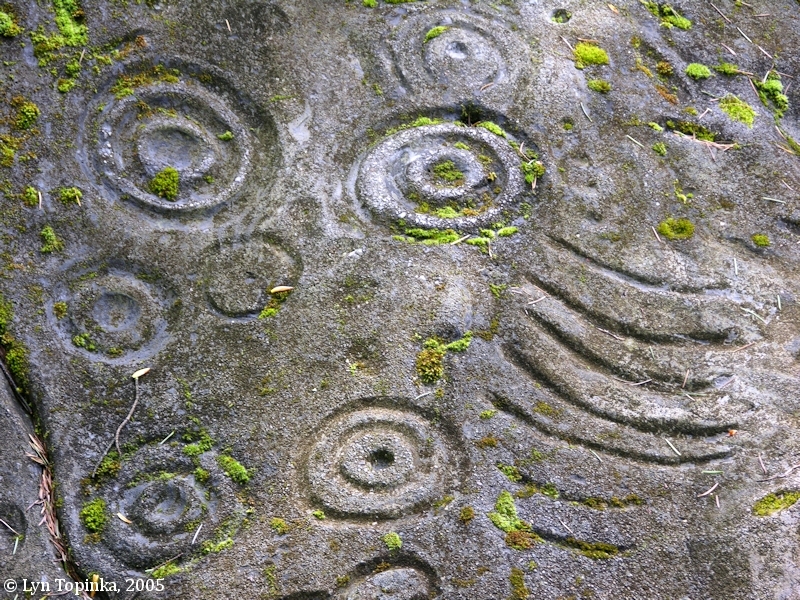 Click image to enlarge Eastern Petroglyph outside the Grant House, Officer's Row, Vancouver, Washington. Image taken December 23, 2017.